We did try to present all of your eggs on the pitch, but we'd have had to delay the kick off! 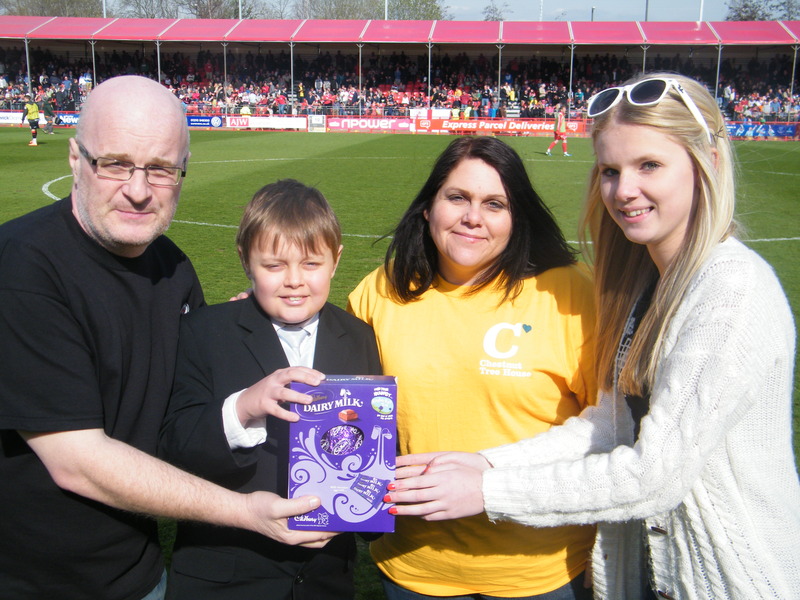 Good Friday saw the culmination of the CTSA/CTFC Easter egg appeal in aid of Chestnut Tree House, with the donation of around 250 chocolate eggs, a cheque for £206 collected on the coach to Bradford, and a small cheque for £2000 from the football club! Vice chairman Paul Prendergast made the presentation to Chestnut Tree fundraiser Terrina at half time. Terrina was very grateful, but was left wondering how she was going to get all of that chocolate into her mini! That sounds like a Guinness World Record Attempt to us! Thanks to all who donated, both we and Chestnut Tree are truly grateful. Chestnut Tree House is the only children’s hospice in Sussex and cares for children and young adults from 0-19 years of age with progressive life-limiting and life-threatening illnesses from all over the county. Completed in 2003, the hospice provides a ‘home from home’ environment with 10 children’s bedrooms plus eight family rooms, a wet and dry play area, computer and music rooms, a multi sensory room and hydrotherapy pool. The house is set in beautiful gardens within an area of outstanding natural beauty. The hospice costs £2.5 million per year to run. Families are never charged for their care and less than 9p in evey pound is funded by the government, so we rely heavily on the generosity, help and support of the people of Sussex.